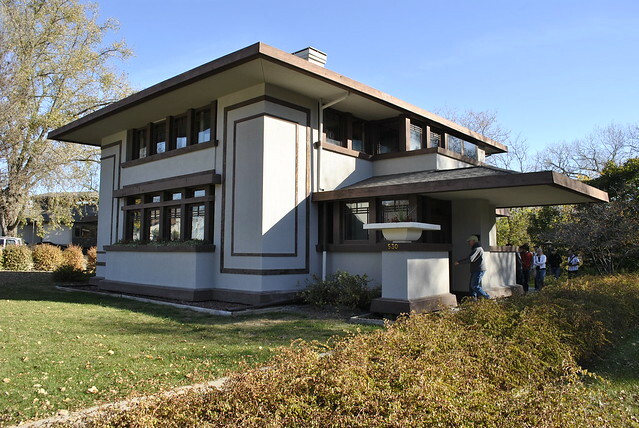 Today I went to see several Frank Lloyd Wright and Wright-inspired buildings in northern Iowa on a field trip for Dan Naegele’s FLW seminar course I am taking this semester. Our day trip took us to Mason City and Quasqueton. We visited the Stockman House (photo above) in Mason City, which was an example of Wright’s $5000 “fire proof homes” concept, though this one was actually built of wood frame, not concrete, so it was not actually fireproof. It was moved from its original location back in the early 1990s to a site along Willow Creek, across the street from Rock Glen, an early 20th century housing development of Wrightian Prairie and Usonian style homes (though not designed by Wright himself). We walked along the creek, which was beautiful with the trees in the fall. Bob McCoy, a local FLW enthusiast showed us around and allowed us inside his own home, the Blythe Residence designed by Walter Burley Griffin, overlooking Willow Creek. While in Mason City we also stopped by to see restoration work at the Park Inn Hotel, one of Wright’s only hotels, located in downtown across from the town square. Built around 1910, this building incorporated a hotel and a bank, and is thought to be a prototype for Wright’s much larger Imperial Hotel in Tokyo, which was demolished in 1962. I must say I was pretty impressed with Mason City, contrary to my previous judgement of the town based solely on the outskirts view from I-35. In the afternoon we drove to Quasqueton, which I did not realize was so close to Cedar Rapids, located in Buchanan County not far from US 20. Near Quasqueton we visited the Lowell Walter House, also known as Cedar Rock, perhaps one of the more well-known Wright houses in Iowa. This is a Usonian house, designed with the most basic domestic needs in mind, at least in Wright’s view. Estimated to cost $5000, the total cost ended up being $150,000 – in 1950 dollars. Extraordinary cost overruns were evidently quite common for Wright, but his clients seemed to put up with him anyway. The Walter House also includes a boat house next to the Wapsipinicon River. It was interesting to see a few of the several homes and buildings Frank Lloyd Wright designed in Iowa. The state actually has a considerable collection, and most in good condition as well. View my photos at the link below. Now online is a photo collection of my visit to Boston last month for a studio field trip. Boston was an incredible place to explore – in addition to seeing our project site in Cambridge (read my response to our site visit on our studio blog), highlights included the ICA, walking tours of MIT and Harvard, and a day trip to see Louis Kahn’s Exeter Library in New Hampshire. Most of all I enjoyed seeing the different neighborhoods and the diversity of historic and contemporary architecture Boston has to offer. My first time to the city, I found the modern financial district built within the confines of the historic winding street system particularly interesting. Boston appeared to be a very clean and pleasant city, not quite like the other big cities I’ve been to on the East Coast. It felt rather low-key for such a large city, perhaps in part due a lack of congruency because of the harbor and the Charles River separating distinct areas. Also there is an overall scale to much of the city that provides for the human and pedestrian experience, rather than the automobile so familiar city noises of “hustle and bustle” seem to be mostly absent. Now in the third week of 5th Year comprehensive studio now, my section has been divided into teams of three and are studying the site and beginning to develop massing studies for the velodrome. I suppose we could refer to this as schematic design. 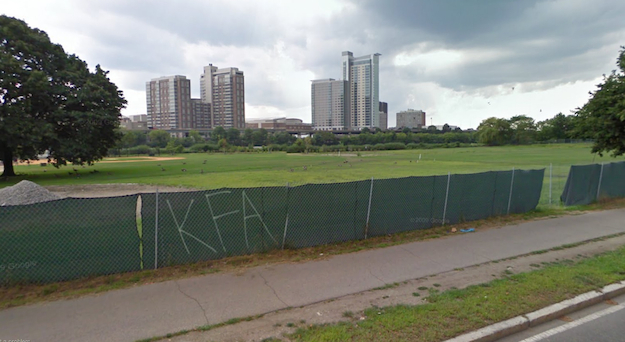 The images above taken from Google Street View show our current project site, viewed from the road bounding it on the north and a panoramic view from across the Charles River to the south. Our site is located in across the road from a residential neighborhood sandwiched between the campuses of Harvard University to the west and MIT to the east. Across the river to the south is the campus and athletic facilities of Boston University. Everyone seems to approach the design challenge from a different angle. Many have focused on creating a dramatic [curving] form evoking a sense of movement expressive of the velodrome program. Alternatively I am much more interested in context and how the building interacts with its surroundings and the existing urban pattern. I tend toward thinking of buildings as compositions of spaces and pieces that can offer human scale, rather than a singular form. Before pairing up we all developed massing studies individually. One of my partners created an expressive curving mass with modeling clay, while mine were much more generic and planar, but attempted to respond to the surrounding site conceptually and practically. My model decisions were generally based on [preconceived] notions about how buildings should respond to supposed “urbanism” and how architectural elements can be used purposefully to announce entry and the program within. Shown below are my two models (top two) and my partner’s model at the bottom. The floor plan shape of my first model draws from the curving form of the Charles River, visible in my previous “Mapping Conversations” diagram. The overall massing of the north facade is flat and rectangular, intended to relate to the street, anticipating urbanism. One corner is cut out, intended to be glazing, to announce the entry. A new open space along to river opens up along the southern curving facade. A pass-through is meant to improve access and encourage connectivity between the river and the residential neighborhood beyond. The separated portion was proposed to house administrative offices and other programs not directly related to the functioning of the velodrome. As I presented this option I quickly began to dismiss it, in favor of my second model. The shape, albeit representational of the river is frankly just awkward and provides no variation or interest in the vertical dimension. However, differentiating the street side versus the river side and the method of announcing entrances and circulation are concepts I carried through to the second iteration. My second mass model was somewhat of a rejection of the general presumption of a curving form. Wanting to maintain the more regular “urban” edge along the street, I used straight facades and angular shapes all over instead of attempting to incorporate curves. I first embellished the announced entry at the same corner, now with a [glass] prow extending out that would act as architectural signage marking the signature point of arrival and circulation within. I stacked three basswood shapes to represent setbacks in the facade, but not necessarily floor plates throughout the building as it was interpreted. (Obvious a large open space would need to be carved out of the center for the velodrome arena.) The north facade along the street maintains consistent and could house the offices and administration functions on the upper level, providing variation and transparency. The river side is stepped back more, with shifted angles on the top that begins to subtly convey the rotational expression of the velodrome within. The lowest basswood shape would be the entry level, raised above ground level parking underneath. An exterior terrace on the east end provides a clear entry condition. Vertical circulation (example: stairs or escalator) from the enclosed parking area up to the terrace would direct all spectators (those who arrive by car and those who walk, bike, or take transit) to the same main entrance. Of course there would be additional auxiliary entrances, but I think it’s important to provide the same arrival experience to those driving and those arriving and foot or bike. Not shown in the photos, but existent on the model as presented was a piece of paper representing a new at-grade plazascape along the east side that connects the street [and neighborhood] to the river and accommodates large crowds during events. A significant critique by my peers was that this form, at least as modeled, is too arbitrary and could easily be any other program. I would agree, but believe a more expressive building form could still be developed without the use of curves. The last photos are of the curving mass model that my partner created out of clay. It is certainly expressive of the velodrome’s essence of movement and rotation, and begins to consider an entry condition with a ramping platform wrapping around the river side, which he imagined as the “front” and primary entry point. Our two models appear to be completely contradictory of each other, but it is now our task to attempt to integrate the aesthetic, contextual, and conceptual ideas embodied in each. I expect to concede to a more curved, visually expressive form, but am determined it will be a composition and not a singular form alone. As I realized in my first model, it is challenging to integrate curved and angular forms and avoid an uncomfortable juxtaposition. But additionally, as I investigate our site and its context further, my original notions about an “urban” response may not be appropriate. In fact, opposite of our site (across the street) is a very low, sprawling middle school that hides from the street behind fencing and a dense layer of trees and overgrown vegetation. The road is busier than an urban street but not quite a highway. The most pedestrian-feeling corner is to the northwest and characterized by a filling station with an amusing oversized Shell sign. How to connect to urban grid of residences blocked by the middle school and the two universities beyond will be a challenge, but a better focus than blind assumptions about a street necessarily being “urban”. Reasonably accommodating 12000 spectators as the project [ridiculously] demands with minimal parking and no immediate transit connection must drive the notion of context that informs an architectural expression that embodies the spirit and essence of competitive cycling. In Charlie Rose’s hour-long interview with four Pritzker Prize laureates – Jean Nouvel, Zaha Hadid, Frank Gehry, and Renzo Piano – they all speak about architecture as an exploratory process, an adventure of making space in reality and enhancing a contextual dialogue with place. They use expressive words to describe not-only the physical qualities of architecture, but the process, tectonics, and especially relational qualities as well. As a means of creating architecture, all four agreed on the need for parameters and, similarly, a partner in design – a client. The notion of complete design freedom was not comprehended as a virtuous, or a plausible condition. Through practical criterion and vision of the client [typically], the program is applied and the architectural idea must be maneuvered in, according to Zaha, which challenges creativity. There also needs to be a strategy or vision with civic projects. This challenge of sustaining an idea through layers of restraint provides direction for realizing and expresses meaning behind an architectural conclusion. For this reason, “clone architecture” is not valued because they often don’t respond to their contextual surroundings. Interestingly, much of the discussion examines cities and designing new architecture in the urban context. These individuals are often criticized for their buildings because they look different and are unlike most buildings we are used to. How to build relationship with existing buildings without simply reproducing it, is critical to them, which Jean Nouvel expressed almost immediately in the conversation. Perhaps the most profound difference between architects and non-architects – or, rather, good architects versus bad ones – is their comprehension of building and site relationships without direct interpretation of what is already made. Renzo Piano speaks romantically of the cities in Italy, made up of layers as if naturally. He sees architecture as fragments of cities, which can provide a diverse context to build upon. Context is beneficial to build from, forcing the design to focus on a smaller angle, assembling a more intense architectural expression. An alliance of time and space stimulates imagination of a building’s enfilade of space, mediating the user experience through architecture. Cinematic influence was especially powerful for Nouvel. The implication of light and space is the tangible language of architecture. Sustainability was talked about not only in terms of environmental and energy conservation, but livability, social implications and spatial quality as well. Frank believes the mantra of sustainability can be greatly misused to promote a false architectural regard. Zaha continues, that sustainability is ultimately to do with the way space is made and advancements in environmental systems cannot be the sole merit of a building’s essence. Renzo argues that buildings need to breathe and work with the earth. Good architecture is the exception, despite much contemporary building activity says Frank. “There are very few people like us,” contending their work is not making an impact since the vast majority of new architecture lacks greatness or validity by some standards. The consistency for great buildings is limited because we allow [“bad”] architecture to happen and put up with it. How to be bold and create a meaningful architecture that is also engaging to the public and societal context, so it may be accepted and celebrated, is the challenge I take away from this discussion. Their focus on civic conditions inspires my thought for designing architecture, regardless of its program, that will be dynamic, respectful, and uplifting to the identity of the city. The new US Courthouse under construction in downtown Cedar Rapids was designed by OPN Architects and William Rawn Associates of Boston, Massachusetts. William Rawn is a very distinguished architect, considered one of the top architects in the country with countless awards and honors to reference. Despite his wide scope of work including several well-known and prominent buildings, he seems to be more modest and understated than other prominent architects who have attained fame outside of the industry for their signature design pedigrees. William Rawn Associates is a surprisingly small firm with just over 30 professionals, with an impressive portfolio. Since discovering the firm I have always had an appreciation for their work. Clarity of design and attention to materiality and details sets the firm apart. I really enjoy the way wood is used in so many of their proejcts, especially in the form of horizontal slats for sun shading or screening. These will be incorporated into Cedar Rapids’ new courthouse for sun screening and aesthetics purposes in the courtrooms. Below is a link to an article from last year in the Boston Globe profiling William Rawn and his impressive career. He designs beautiful buildings that also function well and serve the client’s needs. 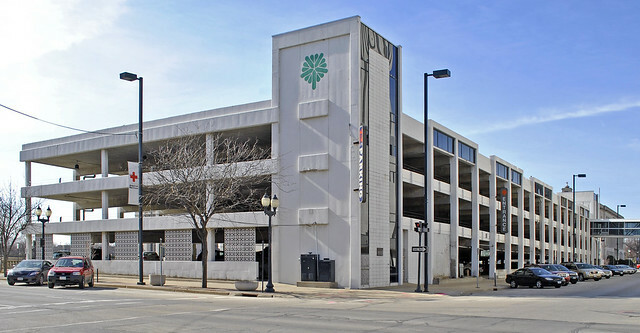 Cedar Rapids is fortunate to have Rawn collaborating on such an important new building.